Bantayog ng mga Bayani Facebook photo. 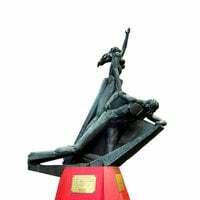 Twelve freedom fighters who opposed Ferdinand Marcos’ martial rule will be honored as martyrs and heroes in special ceremonies at Bantayog ng mga Bayani (Monument of Heroes) in Quezon City on Thursday, the eve of Bonifacio Day. Five of the honorees are collectively known as the Bulacan Martyrs of June 21, 1982. They were arbitrarily killed. Two of the 12 were shot dead. Three died of natural causes. One remains missing. They fought the oppressive Marcos regime in different ways, but their struggle against the dictatorship made them all worthy of emulation and special honors. The addition of their names to the roll of martial law heroes and martyrs brings to 219 the number of names inscribed on the granite Wall of Remembrance at Bantayog, which stands close to sculptor Eduardo Castrillo’s 13.5-meter bronze figure of a defiant mother raising up a fallen son. The monument, the commemorative wall and other structures at the Bantayog complex are dedicated to the memory of the men and women who gave their lives for the restoration of freedom, peace and justice, truth and democracy in the Philippines. The Bulacan Martyrs—Danilo Aguirre, Edwin Borlongan, Teresita Llorente, Renato Manimbo and Constantino Medina—Oscar D. Francisco (1946-2010), Laurente Ilagan (1946-2001), Rogelio Morales (1922-1993), Virgil Ortigas (1952-1973), Raymundo Petalcorin (1949-1976), Bishop Miguel Purugganan (1931-2011) and Victor Reyes (1951- ). The five Bulacan Martyrs were young activists who worked together in opposing the excesses of the dictatorship and helped raise the consciousness of their communities in Bulacan of the evils of martial rule. They were having a meeting on June 21, 1982, when military raiders seized them. The next day, their bullet-riddled bodies were found near the municipal hall in San Rafael, Bulacan. Oscar “Oca” Francisco was an active member of the Student Catholic Action at Mapua Institute of Technology. Later he decided to work in the slums of Tondo district, in Manila, and helped organize the militant Zone One Tondo Organization. During the martial law years, he served as justice and peace training officer and community organizer in the National Secretariat of Social Action-Justice and Peace of the Catholic Bishops’ Conference of the Philippines (CBCP). Francisco was a funny and articulate man, and his ability to elude arrest amazed his fellow activists. After the fall of Marcos in 1986, Francisco continued to work among the poor. He died of natural causes in 2010 while serving as representative of a grass-roots party in Congress. Laurente Ilagan, popularly known as Larry, finished law at Ateneo de Davao University. He worked with the Task Force Detainees of the Philippines of the Association of Major Religious Superiors of the Philippines. He defended political detainees and he himself was arrested and detained. Ironically, the Ilagan Doctrine, a legal doctrine that denies a habeas corpus petition after the filing of charges despite warrantless arrest, was named after him. Ilagan fought it out in court, with prominent human rights defenders, including Joker Arroyo and Haydee Yorac, joining the fight in what would become known as the Ilagan vs Enrile case. Ilagan died of natural causes in 2001. Morales held various positions in the merchant marine industry. His opposition to the Marcos dictatorship led to his removal from the PMMA, but it did not stop him. A fiery speaker, he denounced the dictatorship in gatherings here and abroad. He joined protest movements and did not stop battling Marcos until the dictator fell from power in 1986. Morales died of natural causes in 1993. Virgil Ortigas hailed from Iloilo. His father was a pastor and his mother was a teacher. He studied at Central Philippine University and he organized students to protest creeping repression. When Marcos declared martial law in 1972, Ortigas lived among and worked with sacadas (migrant sugar workers). He campaigned against the ratification of the 1973 Constitution, which he and his fellow militants believed was written to perpetuate Marcos in power. One day, Ortigas and some companions were traveling to a meeting when soldiers stopped them at a checkpoint. Ortigas tried to escape, but was shot dead. Raymundo “Rhyme” Petalcorin was a criminology student at the University of Mindanao when he was drawn to activism. He composed militant but hopeful songs that became popular among activists. He organized farmers and indigenous communities. In 1977, he and several other activists were killed in a raid in Compostela Valley by militia forces belonging to the dreaded Civilian Home Defense Unit that operated under military supervision. Bishop Miguel Purugganan was one of the “Magnificent 7,” members of the CBCP known for their openly defiant stance against the Marcos dictatorship. He supported farmers in Ilagan, Isabela province, in their protests against the intrusion of oligarchs and big landowners that further marginalized rural folk. The Marcos regime referred to him as “subversive bishop” because of his support for efforts toward freedom and justice. He died on July 7, 2011. Victor Reyes went missing on May 7, 1977. He was never found. He was a student of engineering at Feati University when he was drawn into activism by the plight of Metro Manila’s factory workers. Labor organizing was dangerous under the Marcos regime. One day Reyes and a friend, Hermon Lagman (whose name was among the first to be inscribed on the Wall of Remembrance), disappeared. Both are listed as desaparecidos (missing persons). Maria Serena Diokno, chair of the National Historical Commission, is the guest speaker at the Bantayog ceremonies, which begin at 4 p.m. Located near the intersection of Quezon Avenue and Epifanio de los Santos Avenue (Edsa), the Bantayog complex now includes a P16-million building that houses a small auditorium, library, archives and a museum. The 1.5-hectare property on which the Bantayog stands was donated by the administration of President Corazon Aquino through Landbank in 1987. Every year, names are added to the Wall of Remembrance. The first 65 names were inscribed on the wall in 1992. The Bantayog ng mga Bayani Foundation is headed by Alfonso T. Yuchengco. Former Senate President Jovito R. Salonga is chair emeritus.